Great 3 bedroom queen size beds 2.5 bathroom townhome. Sleeps 10. Close to everything. Great entertaining patio deck. Or have a cup of morning coffee while looking off at the view from one of the decks or a glass of wine in the evening to watch the sunset. AC and fireplace so you are always comfortable. Relaxing office space with futon that converts into a bed for two. Living room has pull out for a queen size bed to sleep two more. Quiet neighborhood. At the entrance of the Gateway to the Columbia River Gorge. One block away from The Troutdale House wedding venue and one mile away from McMenamins Edgefield. * $150 cleaning fee per stay for 6 guests. $30 extra per guest per stay for more than 6 guests to offset the extra cleaning, laundry cycles and extra time charged by our cleaners. 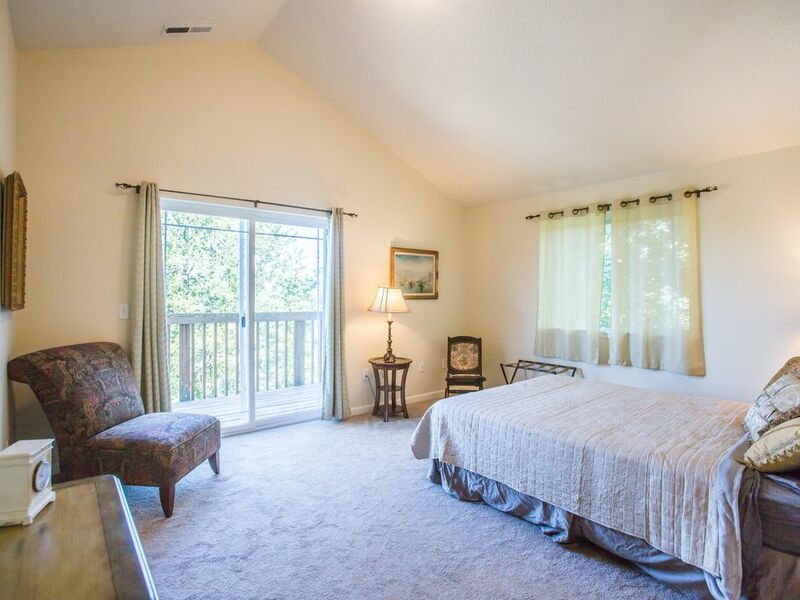 We wanted to share this townhome with others because historic downtown Troutdale is so cute and so close to nature. We thought others should experience it also. Get away to the great outdoors in the Columbia River Gorge. One block from cute shops and good dining. Take a day trip to the Pacific Ocean beaches or Mt. Hood or St. Helens. First Friday art walk happens in Troutdale - meet and speak to artists and have great wine and food. Multnomah Falls, Vista House and Hood River are close also! 6 people fit around the table and 4 bar-stools at the counter. Martin's home was a perfect place for our family to stay for spring break. There was plenty of space, and Martin was kind enough to allow us to have local family to visit during the day. We would happily stay here again. My husband, son and daughter-in-law, and daughter all went to visit family in the Portland area. This place was perfect for us, very warm and cozy. It was close enough to visit Multnomah Falls, as well as downtown Portland. We could hear the train, but it didn't bother us. It was an easy walk to downtown Troutdale. Very enjoyable. What a great little town this condo is in, we had such a wonderful time in Troutdale. The condo was in great shape. Yes there are a lot of stairs but wasn't that bad. You can hear the trains at night but that didn't bother us because we are use to that at home. Very quite neighborhood even though all the parking spots where taken. We had only one car so we parked in the garage. Very convenient location, we were only minutes from Multnomah Falls as well as other wonderful sites. We also visited Cannon Beach which was slightly under an hour away. The airport was under 20 minutes away. We had a wonderful time and would highly recommend this condo. It was perfect for our out of town family coming to my daughters wedding!! Very clean and spacious with lovely amenities. There are lots of stairs from entrance up to main floor and again up to bedrooms...would not be suitable for anyone who couldn’t walk up 14+ steps to each floor. Beds were all very comfortable and lots of room for everyone. Would definately recommend! Nice short walk to downtown Troutdale stores and restaurants.